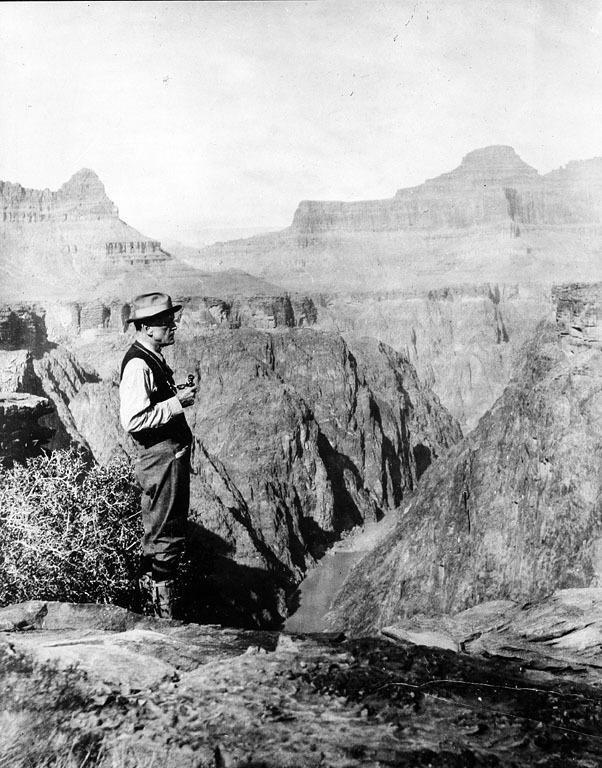 Charles Doolittle Walcott (1850-1927), paleontologist and fourth Secretary of the Smithsonian (1907-1927), stands viewing the Grand Canyon. Record Unit 95 - Photograph Collection, 1850s, Smithsonian Institution Archives, neg. no. 83-14116. 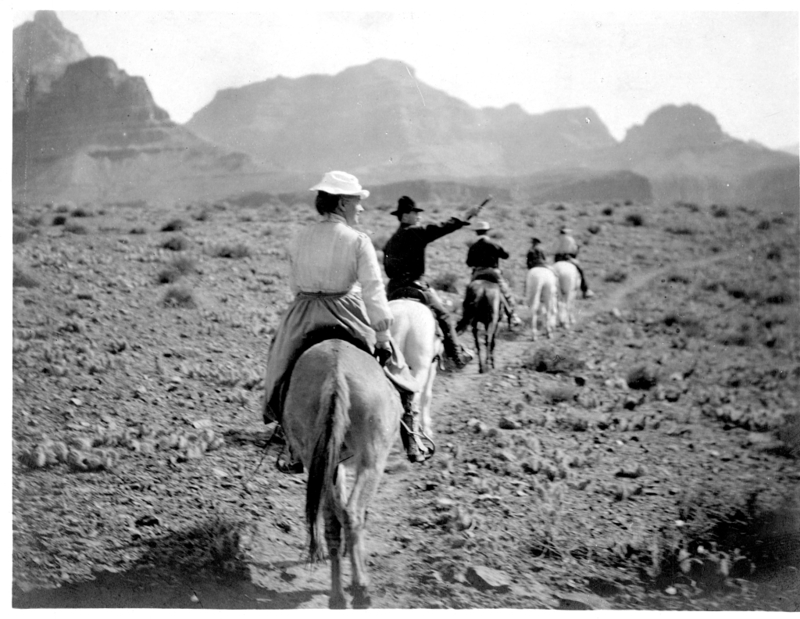 Walcott Family in the Grand Canyon, May 2, 1903. Record Unit 7177 - George P. Merrill Collection, circa 1800-1930 and undated, Smithsonian Institution Archives, neg. no. SIA2010-3246. 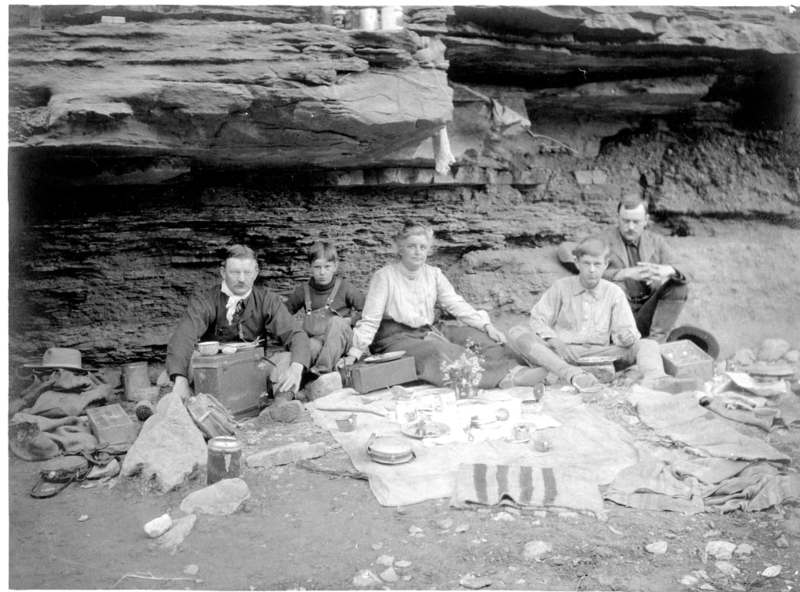 Walcott Family Enjoy a Meal in the Grand Canyon, May 1903. Record Unit 7177 - George P. Merrill Collection, circa 1800-1930 and undated, Smithsonian Institution Archives, neg. no. SIA2010-3247. 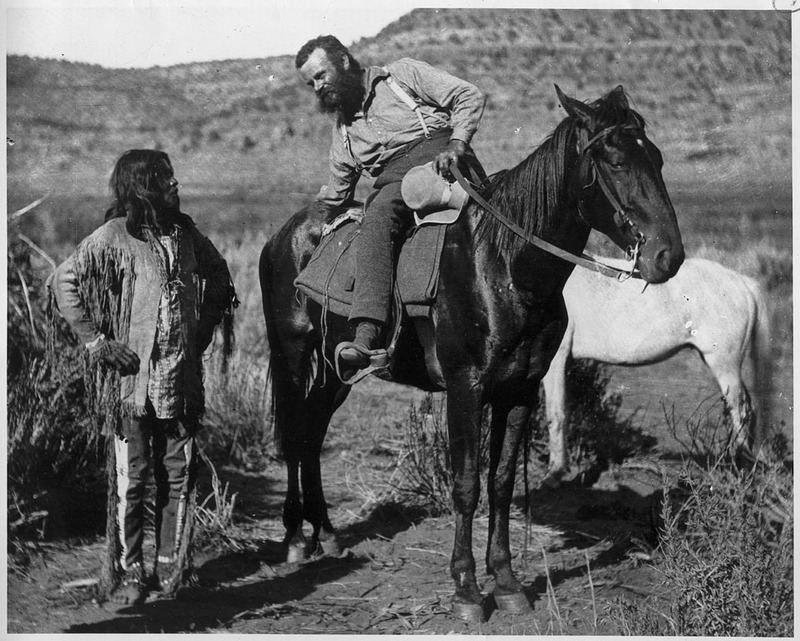 Major John Wesley Powell, seated on horseback and inquiring a Native American of the Paiute tribe, for the way to the water pocket at the Kaibab Plateau, near the Grand Canyon of the Colorado, in northern Arizona, while on one of his expeditions between 1871-1875. Record Unit 95 - Photograph Collection, 1850s, Smithsonian Institution Archives, neg. no. 2002-10682. 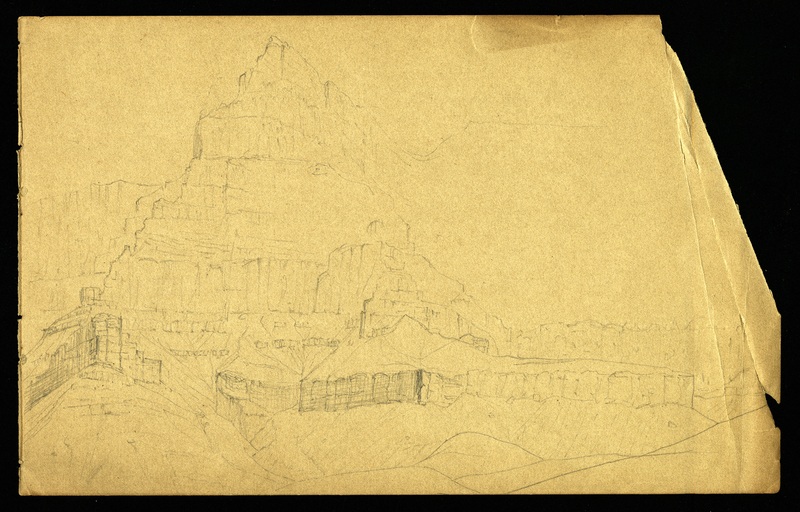 Sketch that documents the field work of Charles D. Walcott in the Chuar Valley of the Grand Canyon, c. 1883. Drawing likely done by B. L. Young. Record Unit 7004 - Charles D. Walcott Collection, 1851-1940 and undated, Smithsonian Institution Archives, neg. no. SIA2012-9660. 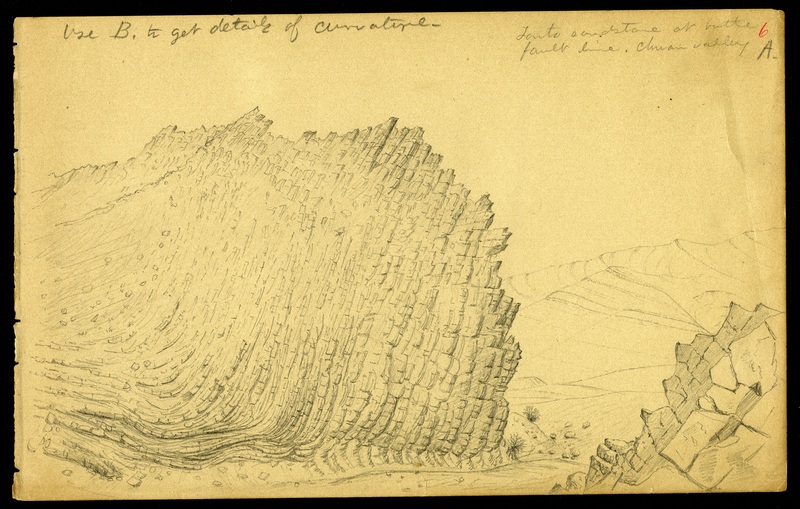 Sketch that documents the field work of Charles D. Walcott in the Chuar Valley of the Grand Canyon, c. 1883. Drawing likely done by B. L. Young. Record Unit 7004 - Charles D. Walcott Collection, 1851-1940 and undated, Smithsonian Institution Archives, neg. no. SIA2012-9661. 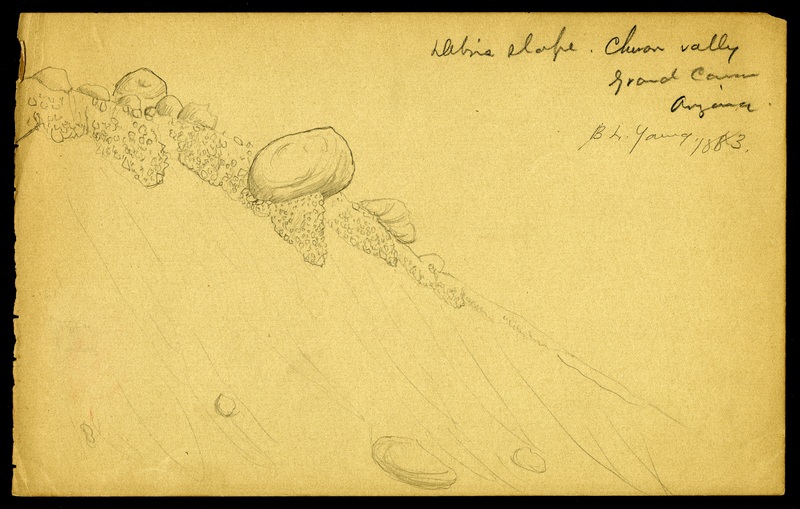 Sketch that documents the field work of Charles D. Walcott in the Chuar Valley of the Grand Canyon, c. 1883. Drawing likely done by B. L. Young. Record Unit 7004 - Charles D. Walcott Collection, 1851-1940 and undated, Smithsonian Institution Archives, neg. no. SIA2012-9662. 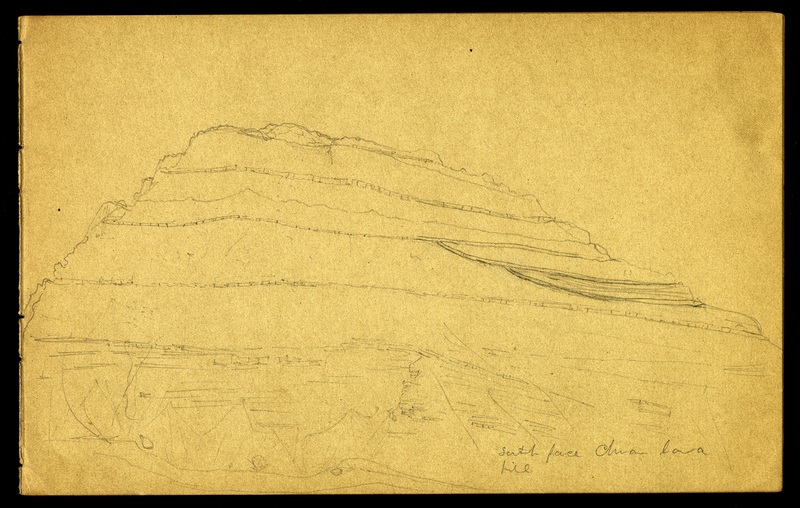 Sketch that documents the field work of Charles D. Walcott in the Chuar Valley of the Grand Canyon, c. 1883. Drawing likely done by B. L. Young. Record Unit 7004 - Charles D. Walcott Collection, 1851-1940 and undated, Smithsonian Institution Archives, neg. no. SIA2012-9664. 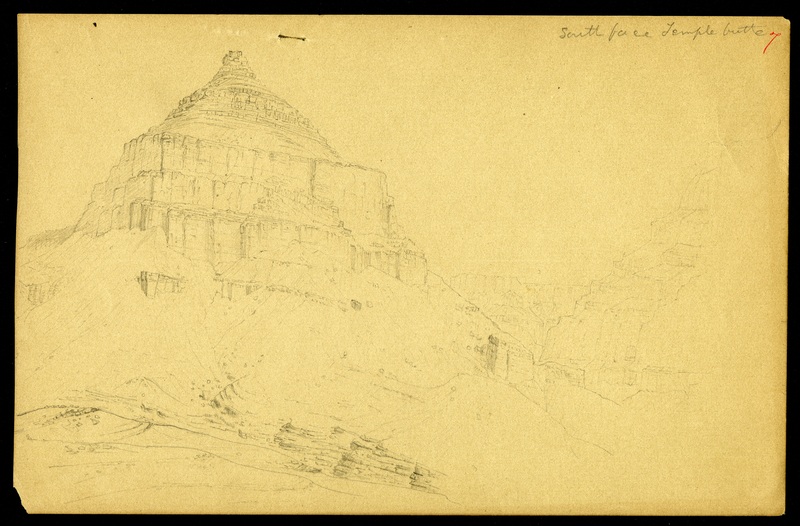 Sketch that documents the field work of Charles D. Walcott in the Chuar Valley of the Grand Canyon, c. 1883. Drawing likely done by B. L. Young. Record Unit 7004 - Charles D. Walcott Collection, 1851-1940 and undated, Smithsonian Institution Archives, neg. no. SIA2012-9665. 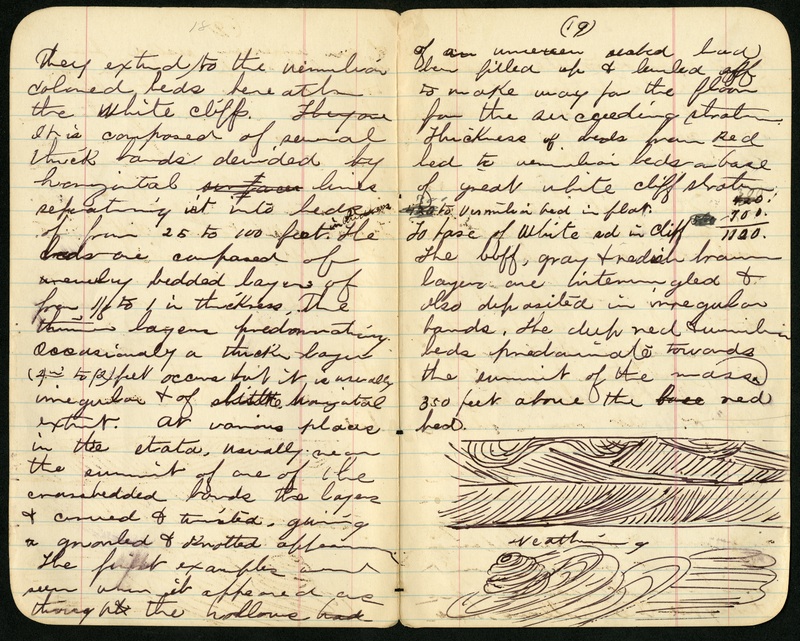 Charles D. Walcott field book, observations of the Grand Canyon in 1879 while in the employ of the U. S. Geological Survey and notes on Arizona in 1930. Record Unit 7004 - Charles D. Walcott Collection, 1851-1940 and undated, Smithsonian Institution Archives, neg. no. SIA2014-01259. 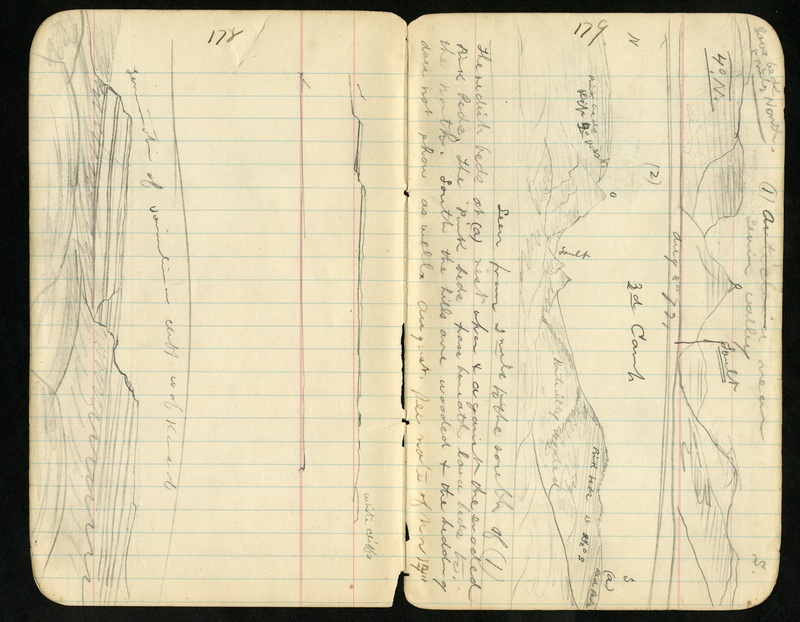 Charles D. Walcott field book, observations of the Grand Canyon in 1879 while in the employ of the U. S. Geological Survey and notes on Arizona in 1930. Record Unit 7004 - Charles D. Walcott Collection, 1851-1940 and undated, Smithsonian Institution Archives, neg. no. SIA2014-01319. Before the Grand Canyon was made a National Park (1919) and before President Theodore Roosevelt placed the Grand Canyon under public protection by declaring it a national monument on January 11, 1908, the Smithsonian was interested in this natural wonder. In fact the first Secretary of the Smithsonian Institution, Joseph Henry wrote to Representative, later President of the United States, James A. Garfield in 1870 to urge that Congress fund John Wesley Powell's continued exploration of the Grand Canyon. Which they did with Congress appropriating $12,000 for Powell's expedition. Additionally in 1903 the fourth Smithsonian Secretary Charles Doolittle Walcott and his family traveled to the Grand Canyon. In honor of this UNESCO World Heirtage Site are some images of the visits to the canyon by Powell and the Walcotts.